SHARPEST ARROW: Arrow Trucks Toronto has been named 2009 Branch of the Year by Arrow Truck Sales and the local dealer has also won an award for selling the most Volvo units. 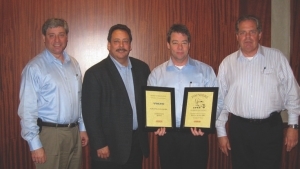 The awards were presented during Arrow Truck Sales’ branch managers’ meeting in San Diego earlier this year. Adam Davy, branch manager of Arrow Truck Sales Toronto, accepted the award, which was part of the company’s Founders Award program. The awards are presented each year to recognize excellent performance in retail sales, the buyer division, branch performance and an open category for all other employees. Pictured (l-r): Frank Oliviera, vice-president, Arrow Truck Sales Canada; Lee Wallace, sr. v.p., sales and marketing; Adam Davy, branch manager, Arrow Toronto; and Carl Heikel, president and CEO, Arrow Truck Sales.